Connor graduated 6th grade yesterday. Well, I say "graduated" but I mean "finished". The school doesn't acknowledge or celebrate it in any way, but I do so I said yesterday was graduation day. We are off now. We are free from other people's obligations and schedules. I don't have to drive 100 miles a day for 3 months, I will drive by choice, for fun, and not sit in traffic and weep. I digress. I am going to make burgers for dinner, "juicy lucy" burgers, you know the kind with the cheese on the inside that'll all oooze out when we bite into them? In my book, the only thing that can go with a burger like that on the first day of summer vacation is, of course, double fried french fries. I make killer fries. I've made killer fries for a long time. My mom taught me how to make them. She'd tell me the story of my grandpa Williams' french fries. I think of both of them every time I make these. I thought I'd blogged them but apparently I haven't. Here's the quickie technique. It seems persnickety but really it isn't, a couple of steps and two quick fries and you'll be the happiest soul in your neighborhood. Really. Take a few potaotes, if it's just you then use two or three large russets if there's a crowd, use more. 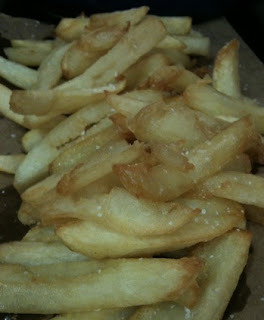 Peel and slice them up into french fry shapes and drop them in a very large bowl covered in cold water. Leave them there will you go do something else. I leave them at least an hour and many times cut them up in the morning and deal with them when I come home. Toss them in the fridge if it's going to be more than a couple of hours. When you are ready to cook, drain them well and dry them in a towel, we want very very dry potatoes here. Heat some oil to about 300 degrees, my thermometer is broken so I do the bread trick. Toss a piece of bread into the oil, when it's brown, the oil is ready to fry. Keep the first fry to a lower temperature, we are cooking them the first time around, letting them sit there and rest then frying them at a higher temperature to brown and crisp them. Cook them in the low oil in a couple of batches about 5 minutes, check for doneness. See how pale and limp they are? They are, however, softly cooked through, light and airy. Leave them on some brown paper bag or on a rack and leave them alone. You'll see I slit through most of them to make more edges to brown and crisp up, it's a personal choice but really, if you care about this experience, you'll slit them! When you want to eat, reheat the oil to 375, do the bread trick again, we want a harder 'boil' this time though, we're looking for shatteringly crisp exteriors and soft potatoey innards. A couple of minutes of frying, pull them when you love the look of them, remember they're cooked! Drain on paper and sprinkle with sea salt or kosher salt. I didn't take a picture, because of the guilt, but the only way to eat these is with a big blob of really good mayonnaise. *yum* let me know how yours turn out! I timed it this time! They took 6 minutes to boil/cook the first time and 6 minutes to become crisp and beautiful the second time. 3 potatoes, overstuffed Connor and I. Really, a pretty cheap food!